Checking my trusty tools before I leave. Packing up my acupuncture needles for the mission. My domestic flight from Manila arrives to Tacloban Airport. After 7 months, relief efforts have stalled due to neglect. With members of Barangay Utap in front of the home of Dondon. A memorial for Maybelle who did not survive meningitis. Used tires repurposed as wells to collect rainwater. They thought I was from Tzu Chi, a Taiwanese Buddhist charity. The kids and I loved to play but they cried when I left. Pusô are woven palm leaves filled with rice. I failed to make one! Grateful for a simple, delicious meal of rice and scallops. Cozy kitchen and dining area in a home at Barangay Sea Wall. Most makeshift structures were half inside and outside. In this clinic my patients sat on wood planks along the edges. Banner commemorating 149 victims from Barangay Candahug. One of the few areas with noticeable albeit slow rebuilding. A pedicycle zooms by the coast of MacArthur Park. Waray vocabulary and Balance Method Acupuncture notes. Two of three Liuterio daughters, Catherine (9) and Nika (2). Guiding the way to Barangay Utap (population 4912). The Peñaflors opened their home as an acupuncture clinic. Rose, my translator, framed in doorway of collapsed building. Wash area of Barangay Ugsap (Sea Wall Reclamation Area) home. Scene of Barangay Ugsap sunset beauty amid the devastation. On behalf of NAFCON (National Alliance for Filipino Concerns), I went on an acupuncture relief mission to Tacloban, Philippines from June 23-28, 2015. Tacloban was one of the most detrimentally affected cities in last November’s Super Typhoon Haiyan (Yolanda) during which 7,000 to 30,000 perished, according to official government or international NGO estimates, respectively. Additionally, hundreds of thousands of survivors are displaced from adequate home, nutrition, and livelihood due to the destruction. My goal was to live among these impoverished but resilient communities (barangays) and address health issues of the local residents. They mainly suffered from musculoskeletal pain, arthritis, digestive issues, acute and chronic asthma, post-traumatic stress disorder, insomnia, vision problems, etc. Although I was only able to treat patients 2-3 times, they were deeply appreciative of even a brief respite of their symptoms. Someone described it to me as relishing a glass of water in the desert. Due to the immediate relief they saw, local nurses and medical workers we intrigued and asked me about the Balance Method Acupuncture (BMA) I was applying. They hoped that I would return in the future to offer them training. I entered the hustle and bustle of urban Manila on Monday, June 23 and was met by my patient, Mara Ibarra, from San Jose, California. She is an United States organizer for NAFCON and facilitated my mission. We travelled from the airport to Quezon City, where the office of the Council for Health Development (CHD) is based. I underwent an orientation about the post-typhoon situation from Dr. Lenni. One of her main themes was the rampant corruption and deception of the Aquino government. For instance, official figures of death were around 7,000. However international NGOs (non-governmental organizations) such as unicef estimated that the deceased numbered closer to 30,000. I also met Mr. Celes, who is the CHD clinic acupuncturist, as well as other staff. That night, I slept on one of the treatment tables before flying out to Tacloban the following morning. Upon reaching Tacloban airport I was met by Paul (a labor dispute advocate) and Jebri (a youth member of People Surge). We boarded an iconic Filipino transport vehicle, the jeepney, and headed straight for our first urban barangay or neighborhood. Rural barangays are alternatively called barrios. We had to walk a kilometer through an outdoor market and port to Barangay #37, also known as Sea Wall or Reclamation Area. Immediately, I was struck by the copious debris still extant seven months after Typhoon Haiyan. I was introduced to the community elders of Sea Wall who were mostly women we referred to with the honorific Nanai. They assured me not only of my safety in but also value to the community. After brainstrorming it was decided that I would set up my clinic in their half-destroyed chapel. At least it was a better choice than the fishing port, which was too open and difficult to secure. We started off with about 12 people who I explained acupuncture to via an interpreter. Many have heard of acupuncture but had never seen, let alone received, it. I told them how the distal approach of BMA works by inducing circulation and healing in the body. The description I gave was flipping a wall switch to affect a ceiling light via wiring. Nodding, they seemed to understand the analogy. People primarily came for asthma, headaches, insomnia, dream-disturbed sleep, digestive problems, arthritis, vision problems, and post-traumatic stress. Almost everyone I met had lost loved ones in the typhoon — sons, uncles, daughters, mothers, cousins, etc. The children especially had emotional disturbances from the disaster, their sleep plagued with scary voices of animals or storms. My patients sat in the pew benches, two columns four rows deep. I walked between the aisles, kneeling before each person and asking them “Hain maol-ol?” That is one of the phrases I learned in the Waray dialect. It means “Where is your pain?”. Just from that one verbal exchange I could determine 80% of my treatment strategy. Because of my experience at a community acupuncture clinic, I could progress efficiently. Thus, in less than 4 hours I was able to serve 35 patients. That evening, I stayed with a three-generational family. I saw one of the elder woman weaving long, slender leaves into tetrahedrons. I found out they put steamed white rice inside to sell. It was renewable, biodegradable packaging. My attempt to mimic her practical artistry failed miserably to the delight of many. But I didn’t give up until I managed at least a semblance of the correct product. However, I did secretly recruit an amazingly patient 5-year old named Joy to guide me fold by fold. Afterwards, the residents asked me if I wanted to take a bath. I was excited to rinse off a humid day of continuous sweat and thus readily agreed. They then pointed in a direction where I saw no bathroom or tub. I squinted and noticed a plywood plank beside a bucket with a plastic ladle and soap-dish beside. It was unexpected but the rustic, outdoor bath was a welcome luxury. I heard ladies giggling in the darkness around me but I did not mind. The next day, Paul came to pick me up and we travelled to Barangay Ugsad via foot and pedicycle (a man-powered, three-wheeled vehicle with a side cart). We travelled to the home of Dondon Liuterio where I would see patients that day. Beside his elevated home of two by fours and corrugated metal and plastic sheeting, I laid out my acupuncture supplies. Soon a steady stream of people streamed into his property and sat on wood planks along three walls. The fourth side was open and had a quaint view of the tree-lined courtyard where a couple dogs were chasing other and the chickens. Making my treatment rounds needle after needle, I slipped into a state of calm focus. Despite an unruly visitor and a few patients nearly fainting, this meditative flow persisted. During a break, I climbed into the front room of the house to rest. It acted as a lobby, living room, dining room, and kitchen, whereas the second, rear room was the sleeping quarters. Hanging on the left wall were several items that caught my eye. Because one was a rosary I thought it was an religious altar. Catherine, on of Dondon’s 9 year-old daughter, noticed me staring and told me that is “for an angel”. Looking closer I saw an identification card labelled with the name Maybelle Liuterio. Later on while Dondon was taking down strings of Christmas lights from the ceiling, he told me they were borrowed for a wake before his second daughter’s funeral. She died two weeks ago because they could not afford medication for her meningitis. He said this so matter of factly that I was caught off guard. Unlike my abstractions of it, death was a familiar and almost living presence to him. After bidding melancholy farewell to the Liuterio’s, I headed straight to the Peñaflor family. Aldrey opened their home as an impromptu acupuncture clinic where I saw patients for eleven hours upon arrival to late that night. Dirt floors, torrential rains, fragile benches, stray dogs, candle shortages. We found a way to adapt to any disturbances so everyone who wanted acupuncture could get treated. After the last patient came and went at literally the eleventh hour, Aldrey grinned and inquired if I had tried tubâ. He did not mean the instrument. I was curious. In a flash he left and return with a lime green pitcher and the same smirk on his face. Coconut palm wine! I will taste most things once but this was something raw. My subdued distaste triggered a festive mood and soon a worn guitar missing the high E string emerged. Clueless what I was singing, if you could call it that, our discordant voices rippled into the darkness. Amid the reverie, I approached a little girl who had laid in a hammock all day. Her mother told me she had a fever and stomach pain. Instinctively, I placed my palms on her forehead and solar plexus. Invoking emptiness, we silently interacted until she fell asleep. To my delight, she was bounding about when I awoke the next morning. Her energetic joy was contrasted by our tearful goodbye that afternoon. Departures sting me even without children weeping as I walk away. This reminded me that the effect of our impressions are based less on duration than depth. Onwards I went to Barangay Candahug. Strolling around, one of the most visible landmarks was a ten-foot tall banner unfurled in front of a church. During the climax of Haiyan, the building was flooded up to the second floor ceiling. 149 victims were lost in Barangay Candahug alone. A resident told me there are 138 barangays in Tacloban. The arithmetic of devastation is staggering. Most families I encountered not only lost members during Typhoon Haiyan but suffered from the slow aftermath of inadequate housing, labor exploitation, infectious disease, and chronic malnutrition. Nonetheless, in conditions where many would sulk or despair, I admired great generosity and dignity. I felt guilty when the sole mosquito net or best blanket was lent to me. I refused being served precious cans of nutrient-dense and calorie-rich sardine. Yet they strongly, almost angrily, insisted. I surrendered, recognizing that it was important for them to give back in some measure. Another sincere offer involved a two-liter bottle of Coca-Cola, which I have declined to sip for years. I hesitated but then acquiesced to receive the sugary liquid with the fullest appreciation. Such is the unseen potency of simple ritual to enact meaningful cycles that weave our existence. On November 8, 2015, the one-year anniversary of Super Typhoon Haiyan, I was invited to speak at Stanford University at a commemoration banquet and vigil hosted by the Pilipino American Student Union. I shared my personal stories treating survivors of the calamity. 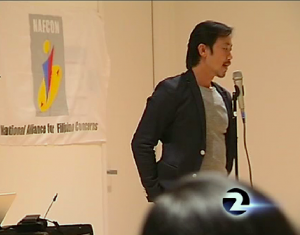 Cara Liu from Channel 2 KTVU News also interviewed me as part of her news report on the event. The report is no longer available online, but for the subsequent weeks several people approached me. They had seen me on television and wanted to thank me for my efforts. I believe if we can connect to compassion, even for a moment, we and those around us can express our better selves.